Lace has seen a resurgence in popularity in recent years, and is currently a very fashionable fabric for bridal gowns. So what is it about lace that makes it so wonderfully bridal and why should you consider a lace wedding dress? Lace slims and flatters bigger brides and while sheer materials can emphasise lumps and bumps, lace falls neatly over them, with the pattern drawing attention away from any imperfections. Equally lace can provide a bit of bulk to skinny brides if a larger more distinctive pattern is chosen. A lace wedding gown can be girly yet graceful, and fun yet elegant, so it goes well with just about any kind of wedding. Lace is beautiful, feminine, soft, quirky, and classical all at the same time, and these are just the characteristics to look for in a wedding dress. Customising a simple high street wedding dress with lace details is a fantastic way to ensure it is one of a kind and to give it a designer appearance. Whether you pick an entire lace wedding gown, or simple lace details, this material adds a touch of sophistication and luxury to which will give your gown a more expensive look, even if it didn’t cost a fortune. Not all brides wish for a completely lace wedding gown, but lace is perfect for those minor details. Lace details can be included at the waist, on the train, all the way to the hem of the dress, or on the veil. A lace overlay on top of a silk dress is a fashionable choice, as are elegant lace sleeves with a predominantly silk gown, or a lace bodice together with a silk skirt. Lace can even be used to create a jacket or shawl. The style, fabric and pattern of lace can make a noticeable difference to the overall style and feel of your wedding dress. A plain white or ivory bridal dress can be hard to customise and add character to, but lace has the extra depth and texture to do this. Lace can be incorporated into wedding stationery, favours, table decorations, and floral arrangements and it gives a classic glamour to your wedding decorations. Whether you have a vintage theme which lace complements, or you choose to have lace as your actual wedding theme, it is easy to include this fabric in your decor. Brides have been wearing lace for decades and it doesn’t feel like it is about to go out of fashion anytime soon. 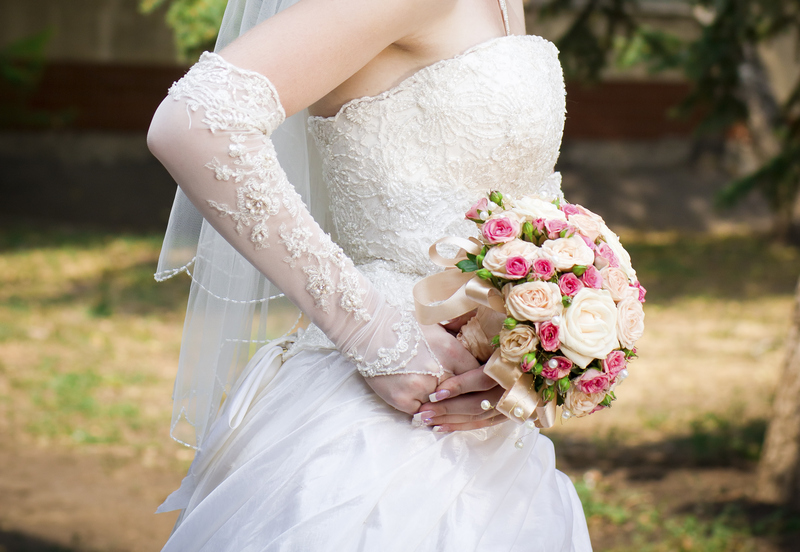 There are a so many lace patterns and styles available, and a lace wedding gown can have a vintage or a modern style. Re-embroidered floral styles such as alencon or Chantilly lace are very popular choices at the moment.